Wolf Trap – Chesapeake Chapter U.S.L.H.S. Congress first appropriated funds for a light at Windmill Point or a lightship on Wolf Trap Shoal in 1819. Two years later, in 1921, a lightship was established at the tip of the shoals. It was not until 1854 that the now 33-year-old ship was pulled out of the water for a long overdue overhaul. It was put back in service the same year and maintained is station until the southern forces destroyed it in 1861. In 1864 another lightship was placed on the shoal to replace the previous ship. After the war, policy was established to replace lightships when possible with screwpile lighthouses. This was because it was much cheaper to maintain a lighthouse than a lightship. In the spring of 1870 work was begun on erecting a screwpile light at Wolf Trap Shoal. The light was first shown on October 1, 1870. It was a fixed, white light with a flash every 30 seconds with a fourth-order Fresnel lens. The light was 38 feet above mean high water. It is noted that the screwpiles of the light were wooden pilings covered with cast-iron sleeves. In January of 1893 heavy ice floes cut the lighthouse from its pilings and swept it 20 miles down the Bay. It was found two days later about a mile north of Thimble Shoal. It was still floating although only the roof and lantern room were above the water. It was towed to the Portsmouth depot for storage. 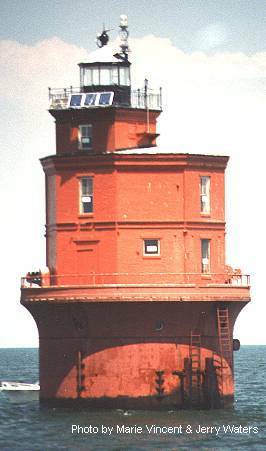 In July of 1893 lightship Number 46 was stationed on the shoals to provide a temporary light. In the same year work started on the new caisson tower that would be placed on the shoal. In December of 1893 the caisson was towed to the location. By April the foundation was completed and work started on the brick three-story lighthouse. The house is octagonal with each side eight feet long. The tower is also eight by eight feet. The new light was first lit on September 20, 1894. The brick lighthouse was painted red about 1930 to protect it from the freezing and thawing action of the salt-water spray. The light was automated in 1971 and all personnel removed. In 2005 the lighthouse became available for ownership under the provisions of the National Historic Lighthouse Preservation Act (NHLPA). No non-profit organization was able to bid for it and as a result it was sold at auction to Nick Korstad of Seattle for $75,000, who had wanted to turn it into a bed & breakfast. In 2007 it changed hands and was sold to veterinarian James Southard, Jr. for $115,000. Some repairs were made and a new roof was installed in 2007. In 2012 the lighthouse goes up for sail again – the asking price was $288.000. In 2017 the U.S. Coast Guard declared that the lighthouse was unsafe for personnel to access and maintain the light and are considering discontinuing the light. Lighthouse Digest adds it to the Doomsday List. As of August 2018 the light was for sale with an asking price of $249.000. Head Keepers: Samuel Trader (1870 – 1874), Willis C. Wilson (1874 – 1875), John L. Burroughs (1875 – 1887), Oliver R. Hudgins (1887 – 1888), Joseph R. Diggs (1888 – 1893), Charles B. Prosperi (1894), Peter W. Jarvis (1894 – 1907), James G. Williams (1907 – 1908), James B. Hurst (1908 – at least 1919), John T. Saunders (1921 – at least 1930), Nelson H. Lewis (at least 1939 – at least 1940), Floyd E. Crewe (at least 1965). First Assistant: Thomas F. Morgan (1870 – 1872), J.B. Owens (1872 – 1873), Dixon Shinault (1873), Willis C. Wilson (1873 – 1874), C.W. Adams (1874 – 1875), Jacob Luskey (1875 – 1876), James K. Hudgins (1876 – 1878), A.F. Hudgins (1878 – 1879), Thomas J. Banks (1879 – 1881), Sidney Lane (1881), E.M. Sandy (1881), Wesley F. Ripley (1881), A.F. Hudgins (1881 – 1882), John W. Morgan (1882 – 1886), Oliver R. Hudgins (1886 – 1887), Joseph R. Diggs (1887 – 1888), Charles F. Hudgins (1888 – 1890), John W. Thomas (1890 – 1893), George E. Hunt (1894 – 1895), James B. Williams (1895 – 1897), Richard W. Marchant (1897 – 1901), Walter M. Shawn (1901 – 1902), Walter S. Hudgins (1902 – 1906), Alexander P. Hurst (1906 – 1907), Edward Farrow (1907 – 1908), John F. Hudgins (1908 – 1909), Virgil J. Montague (1910 – at least 1919), Benjamin D. Preston (at least 1921 – 1925), George C. Hunley (1925 – ), Henry L. Matthews (at least 1926 – at least 1930), Carroll F. Thomas (at least 1939 – 1941), Elmer M. Goodwin (1941 – 1943), Arnold Stout (at least 1965-1966. Directions: This light is located about 3.5 miles off the western shore of the Bay. The start of the directions begins in downtown Gloucester, Virginia. Gloucester is located about 14 miles north of Yorktown on US Route 17. Turn east onto State Route 3 and State Route 14. Go 6.4 miles until 3 and 14 divide. Bear right staying on State Route 14. Continue on State Route 14 for 6.3 miles until the Town of Port Haywood. At Port Haywood, turn left onto State Route 608. Go 1.6 miles until the intersection with State Route 609. Turn left onto 609 and go 3.4 miles to the end of the road. If you can get to the water at this point, the light should be 3.5 miles east, south east. From here on, you are on your own. Please respect the status of private property in this area.